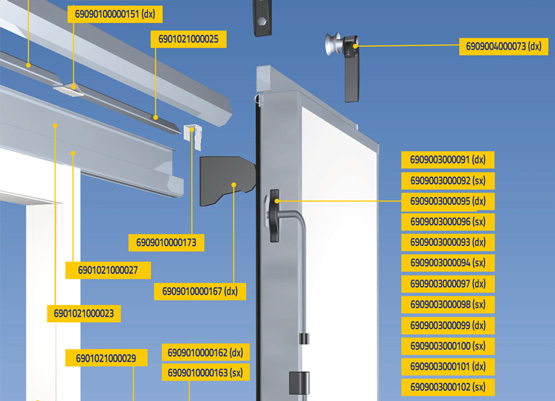 Cutting-edge technologies, long-term experience in the field of refrigeration, unequalled know-how combined with constant innovation in design are just some of the factors that allow us to propose the best solutions for the construction and customisation of components for industrial and commercial cold storage doors. Shipping a door complete with leaf and frame involves high transfer costs, certainly occupying a considerable space in a container, whereas shipping a kit for complete construction of the door reduces space required and also costs. 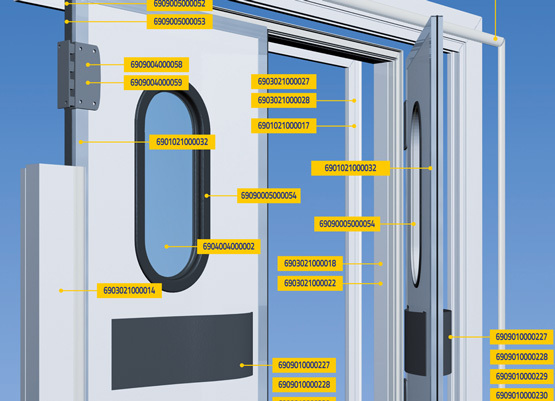 Building on our experience in the construction of cold storage doors, we are able to guarantee a qualified technical and commercial customer service, following up each phase of assembly of the door, studying and developing any request to improve industrialisation of your cold storage doors. 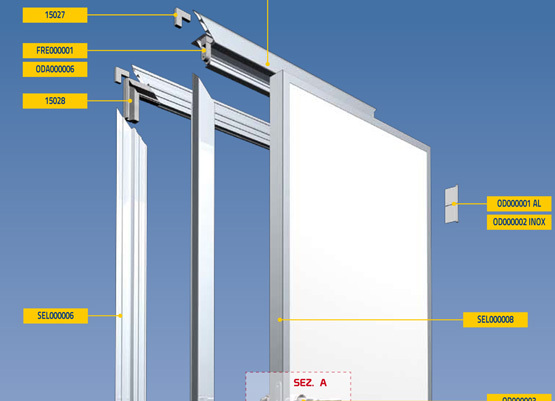 Complete kit for assembly of “SWING DOORS” intended for partitioning of processing rooms with heavy transit of persons or carts, comprising 1 or 2 15-mm thick rigid polyethylene leaves with vision window or foamed-injected leaf; 90° door-stay hinges. 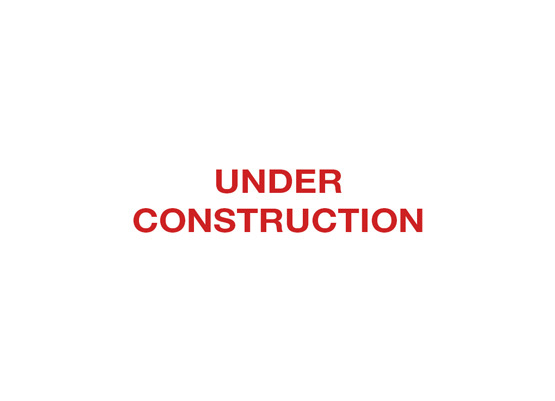 The frame can be constructed with “STANDARD” or stainless steel cladding. “Aircraft wing” kick plates can be fitted on the leaf. Complete kit for assembly of “OFFICE” type doors intended for utility rooms, offices, toilets, consisting of a leaf insulated with 40-mm thick injected polyurethane and an anodised aluminium frame and featuring aluminium hinges and plastic handle, with lock and key or on request with “vacant/engaged” locking lever. The frame and profiles of the leaf are available with “STANDARD” or stainless steel or aluminium cladding. Designed to comply with the most stringent health and safety regulations, the hinged leaf door is the classical cold storage door for small cold cells. Both series are produced in a version for positive temperature, low temperature and with overhead runway and are available in different colours and in a stainless steel version. 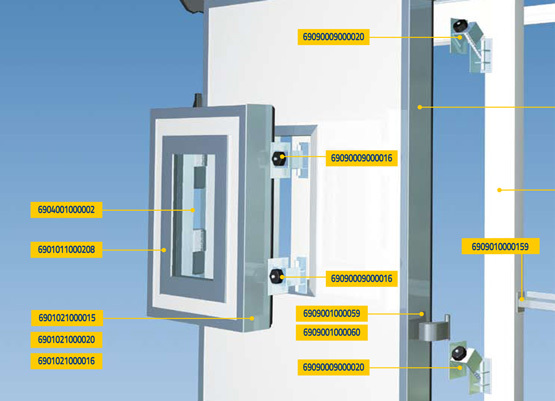 Vertical sliding door for positive and negative temperatures with leaf insulated with injected polyurethane foam. Possibility of perimeter heating resistor housed directly in the aluminium profile of the edge of the leaf under the gasket. 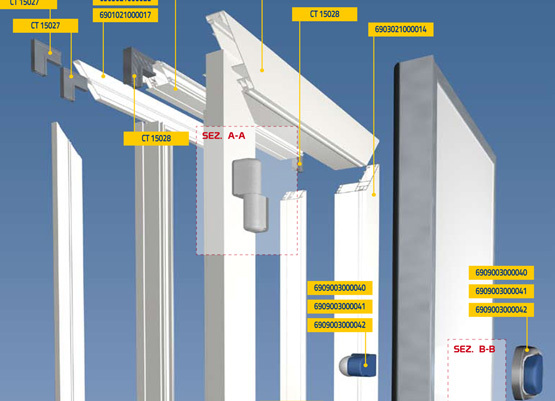 Sliding systems for large size or light sliding doors. Available in different colours and in a stainless steel version. stainless steel and fibreglass cladding A wide range of accessories and colours are available. A wide range of accessories and colours are available. stainless steel and fiberglass cladding.